Background: Parkinson's disease is a progressive neurodegenerative disorder which affects 1% of the population worldwide. It is well known that 1-methyl-4-phenylpyridinium (MPP+) selectively and potentially inhibit Complex I of the mitochondrial electron transport chain. This inactivation leads to the generation of reactive oxygen species (ROS), which in turn damage neurons. In addition, neuroinflammation plays a major role in neurodegeneration processes. 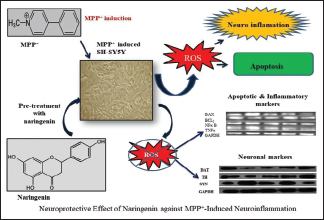 Objective: In the present study, the effect of naringenin (NGN), on MPP+-induced neuroinflammation and ROS generation in SH-SY5Y cells were investigated. Materials and Methods: Cells were pretreated with (0.1% dimethyl sulfoxide) or NGN (25, 50, and 100 μm/mL) for 24 h, and then induced with 1 mM MPP+ for 15 min. Following overnight incubation, cells were harvested for ROS staining, gene expression of apoptotic markers such as B-cell lymphoma-2 (Bcl-2) and Bcl-2-associated X protein (Bax), inflammatory markers such as tumor necrosis factor-alpha (TNF-α), and nuclear factor-κB (NF-κB) and protein expression of neuronal markers such as dopamine transporter (DAT), tyrosine hydroxylase (TH), and α-synuclein (SYN). Results: In this study, NGN exhibited oxidative protection by decreasing ROS generation which is evidenced through significant regulation of oxidative stress markers. Likewise, NGN decreased TNF-α, Bax, and NF-κB and increased Bcl-2 gene expressions in MPP+-induced SH-SY5Y cells compared to normal SH-SY5Y cells. Further, NGN significantly and dose-dependently decreased SYN and increased DAT and TH levels in MPP+-induced SH-SY5Y cells in comparison to the normal cells. Conclusion: The results obtained from the present study revealed that NGN has the potential to encounter MPP+-induced dopaminergic degeneration through regulating ROS generation and neuroinflammation. Abbreviations used: TNF-α: Tumor Necrosis Factor alpha; NF-κB: Nuclear factor; SYN-α: synuclein; NGN: Naringenin; MPP+: 1-methyl-4-phenylpyridinium; MPTP: 1-methyl-4-phenyl-1,2,3,6- tetrahydropyridine; PD-Parkinson's disease; DCFH-DA: 2',7' - dichlorofluorescin diacetate; SOD: Superoxide dismutase; NO: Nitric oxide; MDA: Malondialdehyde; DAT: Dopamine transporter; TH: Tyrosine hydroxylase; ANOVA: Analysis of variance; SEM: Standard error of the mean; RT-PCR: Reverse transcriptase-polymerase chain reaction; BSA: Bovine serum albumin; PBS: Phosphate buffered saline; TBST: Tris-Buffered saline with Tween; RNA: Ribonucleic acid. Parkinson's disease (PD) is a neurodegenerative disorder associated with symptoms such as resting tremor, rigidity, bradykinesia, and postural instability. On a molecular and neurochemical level, PD is characterized by selective loss of dopaminergic (DA) neurons in substantia nigra pars compacta (SNpc) and depletion of dopamine in striatum. The reasons behind the loss of DA neurons could be attributed to reactive oxygen species (ROS), mitochondrial dysfunction, excitotoxicity, and inflammation. The mitochondrial defect in PD is linked with inhibition of electron respiratory chain Complex I activity. This inactivation leads to the generation of ROS which in turn damage neurons in association with neuroinflammation. The regulation of intracellular ROS is an important physiological aspect in the normal functioning of a system and disruption of this leads to deleterious effect in the body both at cellular and molecular level. Lipid peroxidation (LPO) is the primary result of oxidative stress and affects the level of malondialdehyde (MDA), a metabolite of membrane LPO, resulting in cell death. Nitric oxide (NO) is also considered to be the key mediator in oxidative stress-induced cell death. Previous studies have shown that an increasing superoxide dismutase (SOD) activity protects the DA neurons against the toxin-induced neurodegeneration. 1-methyl-4-phenylpyridinium (MPP+), the active metabolite of 1-methyl-4-phenyl-1, 2, 3, 6-tetrahydropyridine (MPTP), has been proven for its selective complex I inhibition of the mitochondrial electron transport chain. MPP+ and MPTP are well-proven models to study the efficacy of various drugs in PD. Generations of intracellular ROS and neuroinflammation have been demonstrated in MPP+-induced neurotoxicity. Naringenin (4, 5, 7-trihydroxy flavonone; NGN) is a naturally-occurring bioflavonoid that is found in citrus fruits and vegetables. NGN possess pharmacological properties such as neuroprotective, anticancer, antiatherogenic, hepatoprotective, and nephroprotective activities. In the present study, the effect of NGN on neuroinflammation and intracellular ROS generation in MPP+-induced neurotoxicity in human neuroblastoma SH-SY5Y cells were investigated. NGN, MPP+, 2', 7'-dichlorofluorescin diacetate (H2 DCFDA), dimethyl sulfoxide (DMSO), MDA, thiobarbituric acid, and TRIzol reagent were purchased from Sigma Aldrich, USA. Mouse anti- α-synuclein (SYN), rat anti-dopamine transporter (DAT), rabbit anti-tyrosine hydroxylase (TH), and their respective secondary antibodies were procured from Santa Cruz, USA. Polymerase chain reaction (PCR) master cycler gradient was purchased from Genet Bio, Korea. DMEM/Ham's F-12, heat-inactivated fetal calf serum (FCS), L-glutamine, penicillin, streptomycin, and nonessential amino acids were procured from Gibco, USA. Primers were procured from Eurofins India. SH-SY5Y cell lines were procured from the National Centre for Cell Science, Pune. Unless mentioned, all other chemicals and reagents were of analytical grade. Human neuroblastoma SH-SY5Y cells were cultured in Dulbecco's modified Eagle Medium/Ham's F-12 medium, supplemented with 10% (v/v) FCS, 2 mmol/L L-glutamine, 50 U/mL penicillin, 100 mg/L streptomycin and nonessential amino acids, and maintained at 37°C in a humidified 5% CO2 and 95% O2 atmosphere. The medium was changed every 3 days and the cells were passaged every 4–5 days. SH-SY5Y cells were seeded on 96-well plates at a density of 0.5 × 105 cells/well. The cultures were grown for 24 h followed by the addition of fresh medium containing different doses of NGN (1, 10, 100, 500, 1000 μM/mL) for 24 h duration before they were subjected to MPP+ (1 mM) exposure. Cell viability was determined by MTT assay. After incubation for 24 h with the desired drug, 50 μl of MTT reagent (5 mg/mL MTT in phosphate-buffered saline (PBS) containing 10 mM HEPES; filter with 0.22 μm) was added to each well and incubated in a CO2 incubator for 4 h. The medium was aspirated from each well and dissolved the remaining MTT-formazan crystals by adding 200 μL of DMSO to all the wells in column, and the absorbance was measured in a microplate reader at 570 and 630 nm. Based on the MTT assay, the doses (25, 50, 100 μM/mL) were selected for further studies. SH-SY5Y cells were incubated with different concentrations of NGN for 24 h, then added 1 mM MPP+ and incubated for 2 h. Following overnight incubation of fresh media with NGN, the number of viable cells was determined using trypan blue exclusion assay. Cells were collected and rinsed with PBS. After which they were immediately stained with 0.4% trypan blue solution, and the number of viable cells were counted using a hemocytometer under a light microscope. SH-SY5Y cells were treated with three different concentrations of NGN (25, 50, 100 μM/mL) and/or MPP+ and incubated at 37° C as mentioned above. Following incubation, the media was removed, and the cells were washed 3 times with 1X PBS (pH 7.2). 10 μM of 2',7' - dichlorofluorescin diacetate was added to all the wells, and they were incubated at 37° C for 30 min and fluorescence intensity of DCF was measured in a microplate-reader (Thermo Scientific Multiskan spectrophotometer, USA) at excitation wavelength 485 nm and emission wavelength 535 nm. SH-SY5Y cells were mechanically harvested and then collected by centrifugation at 2,000 g for 10 min at 4° C. The pellets were homogenized in 1 ml of cold 20 mM HEPES buffer, pH 7.2 (1 mM Ethylene Glycol Tetra acetic Acid, 210 mM mannitol and 70 mM sucrose) and sonicated (3 times, 5 s). The samples were then centrifuged at 1,500 g for 5 min at 4° C. To 0.1 ml of the supernatant, 0.25 ml of sodium pyrophosphate buffer (0.025 M), 0.025 ml of phenazonium methosulphate (186 μM), and 0.075 ml of nitro blue tetrazolium (300 μM) were added. The reaction was triggered by the addition of 0.075 ml of NADH (780 μM). After incubation at 30° C for 90 s, the reaction was terminated by addition of 0.25 ml glacial acetic acid. The mixture was stirred vigorously and shaken with 2 ml of n-butanol and allowed to stand for 10 min and centrifuged. N-butanol alone served as blank. The color intensity of the chromogen was read at 560 nm in Thermo Scientific Multiskan spectrophotometer, USA. NO has been identified as a mediator of cytokine action in various cell types. NO is an intra- and intercellular messenger that mediates a variety of important physiological processes. Changes in NO production were measured indirectly as the accumulation of nitrites (the end-product of NO metabolism) in the medium using Griess assay. Neuroblastoma SH-SY5Y cells were incubated with NGN (25, 50, 100 μM/mL) and/or MPP+ (1 mM) as mentioned above. After incubation period, 1 ml of the culture supernatant was mixed with 1.0 ml of Griess reagent (1% sulfanilamide, 0.1% naphthyl ethylenediamine dihydrochloride, and 2%–5% H3 PO4) for 10 min at room temperature. The concentration of nitrite was measured by microplate reader (Thermo Fisher Scientific, USA) at 540 nm, and the nitrite concentration was calculated using a standard curve of sodium nitrite. SH-SY5Y cells were seeded in a six-well plate. After cells achieved the 65% confluence, LPO was determined by measuring the amount of thiobarbituric acid reactive substances formed during the decomposition of lipid hydroperoxides, mostly formed from MDA. Cells were collected in 2 ml of culture medium and sonicated for 3 s × 5 s intervals at 40 V over ice. Sodium dodecyl sulfate (SDS) lysis solution (1.0 ml) was added to the sample solution in a microcentrifuge tube and mixed thoroughly. Then, 2.5 ml of TBA reagent were added to each sample and standard to be tested, incubated at 95° C for 60 min. Each sample were loaded (in duplicate) into a clear 96-well plate and the absorbance at 532 nm was recorded using a microplate reader (Thermo Fisher Scientific, USA). Reverse transcriptase (RT)-PCR was performed to determine the level of mRNA expression of Bcl-2-associated X protein (Bax), B-cell lymphoma-2 (Bcl-2), tumor necrosis factor-alpha (TNF-α), and nuclear factor κB (NF-κB). The housekeeping gene GAPDH was used in this study as a reference for relative gene expression. Total ribonucleic acid (RNA) was extracted from cultured SH-SY5Y cells using TRIzol Reagent (Sigma, USA). After retrieving the cells, the tubes were incubated for 10 min and centrifuged at 1000 rpm for 5 min. To the supernatant, 100 μl of chloroform was added, incubated for 5 min at room temperature and centrifuged at 12,000 rcf for 20 min. Then, 250 μl of isopropyl alcohol was added to the supernatant to precipitate the total RNA and centrifuged at 12,000 rcf for 15 min following the incubation period of 10 min. The supernatant was decanted carefully, and the pellet was washed three times with 75% ethanol and centrifuged at 12,000 rcf for 15 min and the pellet was dried. The dried pellet was resuspended in 20 μl of RNase-free water and stored at −80°C until use. The isolated RNA was allowed to undergo reverse transcription and polymerization reaction to get cDNA using PCR master cycler gradient (Genet Bio, Korea). The gene expression was analyzed using the bands formed in agarose gel electrophoresis, captured using Gel documentation unit (VilberLaumar, Germany) and quantified by ImageJ software. The primer sequences used in the study are presented in [Table 1]. Cells were lysed with 0.1 mL of lysis buffer (1% Nonidet P-40; 50 mM Tris HCl, pH 7.6; 5 mM EDTA), followed by 30 min incubation on ice. Lysate was centrifuged at 15,000 g for 10 min at 4°C. The supernatant (total lysate) was collected and protein levels were determined. Samples containing 40 μg protein were separated in SDS-PAGE (100V) and transferred to polyvinylidene fluoride polyvinylidene difluoride membrane (230 mA for 90 min). Membranes were blocked with 5% milk for 1 h and washed three times with tris-buffered saline (TBS) for 5 min each. Primary rabbit polyclonal TH (1:100), mouse monoclonal SYN (1:100), rat monoclonal DAT (1:50) in 1% bovine serum albumin (BSA), 0.1% Tween-20, and 0.02% sodium azide in TBS. After washing with BSA in TBS, the membrane was incubated in anti-rabbit IgG (1:300), anti-mouse IgG (1:100), anti-rat IgG (1:100) secondary antibody in BSA for 1 h, and washed with TBS with Tween. The bands were visualized with enhanced chemiluminescence solution. Data were expressed in mean ± standard error of mean. Mean difference between the cells were analyzed using one-way ANOVA followed by Tukey's multiple comparison test as post hoc using Graph Pad Prism 5.0. P ≤ 0.05 was considered to be statistically significant. Cytotoxicity was performed to evaluate the cell survival as a function of mitochondrial viability. There was no significant difference between control and 0.1% DMSO-treated cells. 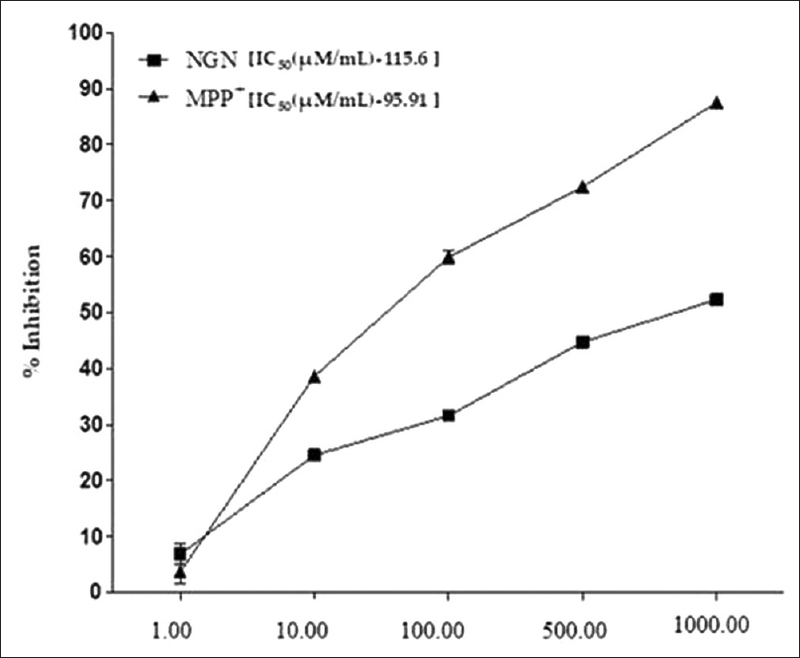 A 24 h incubation period of MPP+ (1, 10, 100, 500, 1000 μM/mL) and NGN at increasing concentrations (1, 10, 100, 500, 1000 μM/mL) reduced the cell viability in a concentration dependent manner when compared with control [Table 2]. The LD50 was calculated using graph pad prism 5.0 the LD50 value for NGN and MPP+ was observed to be 115.6 and 95.91 μM [Figure 1]. ROS played a crucial role in cell apoptosis and mitochondrial transmembrane potential changes were considered to be in ROS production. ROS production was measured using fluorescent dye DCFDA. 1 mM MPP+ showed significant increase in ROS production (F [4, 10] = 27.86, P < 0.01) when compared to the normal cells. Whereas, NGN (25, 50, and 100 μM/mL) treatment reduced ROS production in MPP+-treated SH-SY5Y cells [Figure 2]. To determine the suppression of MPP+-induced ROS production by NGN, we measured ROS production in SH-SY5Y under different conditions. Therefore, observed results suggest that NGN acts as an anti-oxidant agent to MPP+-mediated ROS generation. Moreover, the results showed that MPP+-induced cells significantly increased (F [4, 10] = 8.152, P < 0.01) MDA levels. On the other hand, NGN at 50 and 100 μM/mL concentrations significantly decreased (P < 0.05) MDA levels compared to 0.1% DMSO-treated MPP+-induced cells. MPP+-induced NO production in neuroblastoma SH-SY5Y cells were shown in 1 mM MPP+ with significant increase (F [4,10] = 6.656, P < 0.01). However, NGN at 100 μM/mL significantly decreased (P < 0.05) NO level in comparison to MPP+-treated cells. A significant decrease in SOD activity was also observed in MPP+-induced cells compared to control, whereas treatment with NGN at 100 μM/mL significantly increased (P < 0.01) SOD activity in comparison to MPP+ cells. Based on these findings, it is clear that NGN possess potent anti-oxidative properties against MPP+-induced oxidative stress in SH-SY5Y cells [Figure 3]. NGN protects cells from MPP+-induced apoptotic death which is clearly evidenced from the results obtained in gene expression studies. It was found that the expression of Bax and Bcl-2 genes were affected by MPP+ treatment. The intracellular Bax (F [4,10] = 4.731, P < 0.05) expression was increased significantly in 1 mM MPP+-treated cells compared with the control cells, whereas the intracellular Bcl-2 (F [4,10] = 6.756, P < 0.01) was down regulated in MPP+-treated cells. 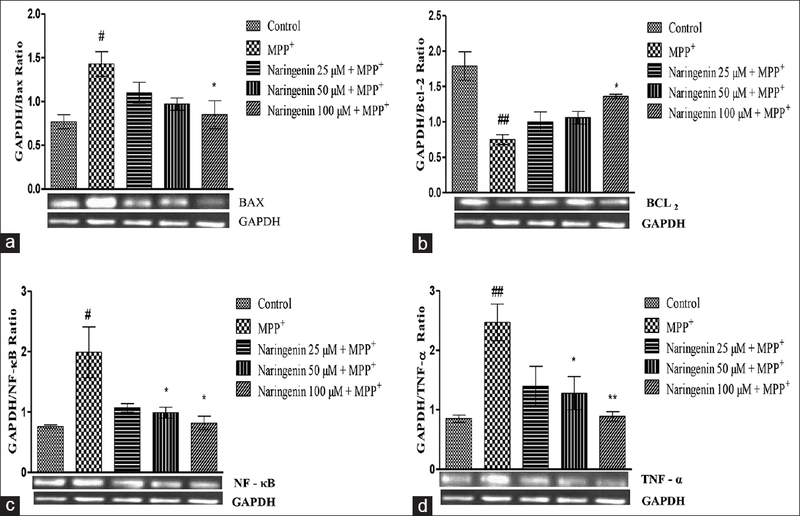 NGN treatment (100 μM) prevented MPP+-induced up regulation of Bax and down regulation of Bcl-2. 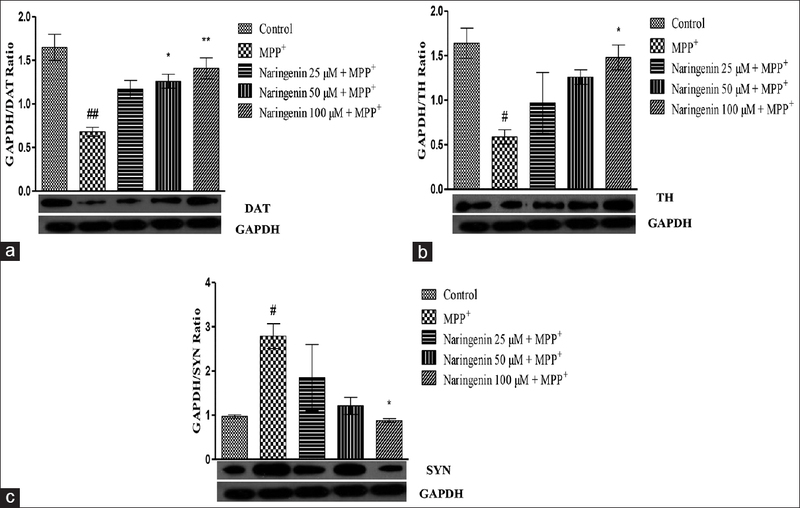 These results suggest that MPP+ shifts the balance between pro-apoptotic and anti-apoptotic proteins whereas NGN prevented this type of alteration [Figure 4]a and [Figure 4]b. The main inflammatory factors, TNF-α increased during neurodegenerative diseases and induces apoptosis through a death receptor-dependent (extrinsic) or independent (intrinsic or mitochondrial) pathway. Following 24 h treatment of SH-SY5Y cells with MPP+ (1 mM), we observed increase in TNF-α activity (F [4,10] = 7.326, P < 0.01). The addition of NGN at 50 and 100 μM significantly and dose dependently attenuated (P < 0.05 and 0.01, respectively) MPP+-induced TNF-α activation and reduced the active form of TNF-α in the NGN-treated cells. The NF-κB transcription factors have emerged as a major regulator of apoptosis or necrosis, which contributed a crucial anti-apoptotic effect during normal development. In this study, we observed that MPP+ alone could restrain the constitutive NF-κB activity significantly (F [4, 10] = 6.149, P < 0.05). On the other hand, NGN (50 and 100 μM) significantly reduced (P < 0.05) the nuclear factor expression in neuroblastoma SH-SY5Y cell line [Figure 4]c and [Figure 4]d.
SYN is a presynaptic neuronal protein that is linked with protein aggregation which leads to neuronal death. Results showed that SYN is significantly up-regulated in MPP+ (F [4, 10] = 4.646, P < 0.05) treated cells when compared to normal cells. TH is the rate limiting enzyme and DAT is the transporter for dopamine and found both the proteins were down-regulated (F [4, 10] = 4.945, P < 0.05 and F [4, 10] = 11.55, P < 0.01, respectively) in MPP+-treated cells when compared to control cells. On the other hand, NGN (100 μM) significantly increased DAT (P < 0.01) and TH (P < 0.05) levels and decreased SYN (P < 0.05) level in comparison to MPP+-treated SH-SY5Y cells [Figure 5]. The present study revealed that pretreatment with NGN significantly reduced the ROS production by decreasing oxidative stress markers such as LPO and NO and increasing SOD level. In addition, pretreatment with NGN decreased the inflammatory markers such as TNF-α and NF-κβ in MPP+-treated SH-SY5Y cells. Further, NGN decreased the pro-apoptotic marker – Bax and increased the anti-apoptotic marker – Bcl-2 in MPP+-induced SH-SY5Y cells. These data clearly showed that pretreatment with NGN restores MPP+-induced neurotoxicity through regulating ROS production and neuroinflammation in SH-SY5Y cells. Mechanism of MPP+-induced neurotoxicity is largely mediated through mitochondrial dysfunction. MPP+ enters DA cells through DAT and inhibits complex I enzyme in mitochondrial electron transport chain. This decreases ATP production and triggers the generation of ROS and apoptosis which in turn leads to neuronal cell death. TH, a rate-limiting enzyme was found to be significantly suppressed in MPP+-induced neuronal cells. In the present study, pretreatment with NGN increased the DAT and TH levels in a dose-dependent manner which showed its protective effect against MPP+-induced neurotoxicity. It is well known that MPP+ induces microglial activation through the activation of pro-inflammatory cytokines like TNF-α which then activates other cytotoxic molecules such as superoxide, NO, and ROS. Further, NGN showed the involvement of NF-κβ in both onset and determination of inflammatory process. The observed decrease in inflammatory markers such as TNF-α and NF-κβ, and oxidative stress markers such as LPO, NO, and ROS in NGN-treated MPP+-induced SH-SY5Y cells clearly revealed its protective effect. Overexpression of SYN is the key important marker and has been demonstrated in various experimental models of PD. Studies in numerous cell lines and primary neuronal culture demonstrated that overexpression of SYN induces apoptotic cell death. Evidence support the involvement of proapoptotic marker Bax in postmortem SNpc neurons in PD. In the present study, pretreatment with NGN decreased pro-apoptotic marker-Bax and increased anti-apoptotic marker – Bcl-2 in MPP+-induced neurotoxicity in SH-SY5Y cells. These data clearly showed the unswerving involvement of NGN in the restoration of MPP+-induced alterations in an in vitro PD model. In conclusion, NGN decreased neuroinflammation, ROS generation, and apoptosis and also SYN activation. In addition, pretreatment with NGN increased DAT and TH levels in MPP+-induced SH-SY5Y cells. Further, NGN decreases NO, and MDA levels and increases SOD activity. Thus, it is clear that NGN has the potential to encounter MPP+-induced DA degeneration through regulation of ROS generation, neuroinflammation, and oxidative stress. Based on the results obtained, it is clear that NGN may be considered to be the better therapeutic choice in the treatment of PD. Further studies may warrant to clearly elucidate the molecular mechanism of NGN in protecting against neuronal cell death in PD. Authors extend thanks to Director, CEFT, SRU, Chennai, for providing facilities while working in laboratory. Schapira AH. Science, medicine, and the future: Parkinson's disease. BMJ 1999;318:311-4. Deumens R, Blokland A, Prickaerts J. Modeling Parkinson's disease in rats: An evaluation of 6-OHDA lesions of the nigrostriatal pathway. Exp Neurol 2002;175:303-17. Perry TL, Godin DV, Hansen S. Parkinson's disease: A disorder due to nigral glutathione deficiency? Neurosci Lett 1982;33:305-10. Lin MT, Beal MF. Mitochondrial dysfunction and oxidative stress in neurodegenerative diseases. Nature 2006;443:787-95. Moldzio R, Radad K, Duvigneau JC, Kranner B, Krewenka C, Piskernik C, et al. Glutamate-induced cell death and formation of radicals can be reduced by lisuride in mesencephalic primary cell culture. J Neural Transm (Vienna) 2006;113:1095-105. Koprich JB, Reske-Nielsen C, Mithal P, Isacson O. Neuroinflammation mediated by IL-1beta increases susceptibility of dopamine neurons to degeneration in an animal model of Parkinson's disease. J Neuroinflammation 2008;5:8. Simon HU, Haj-Yehia A, Levi-Schaffer F. Role of reactive oxygen species (ROS) in apoptosis induction. Apoptosis 2000;5:415-8. Wei D, Zhang XL, Wang YZ, Yang CX, Chen G. Lipid peroxidation levels, total oxidant status and superoxide dismutase in serum, saliva and gingival crevicular fluid in chronic periodontitis patients before and after periodontal therapy. Aust Dent J 2010;55:70-8. Botella JA, Bayersdorfer F, Schneuwly S. Superoxide dismutase overexpression protects dopaminergic neurons in a Drosophila model of Parkinson's disease. Neurobiol Dis 2008;30:65-73. Singer TP, Ramsay RR. Mechanism of the neurotoxicity of MPTP. An update. FEBS Lett 1990;274:1-8. Beal MF. Experimental models of Parkinson's disease. Nat Rev Neurosci 2001;2:325-34. Pariyar R, Lamichhane R, Jung HJ, Kim SY, Seo J. Sulfuretin attenuates MPP+-induced neurotoxicity through akt/GSK3β and ERK signaling pathways. Int J Mol Sci 2017;18. pii: E2753. Yusof S, Ghazali HM, King GS. Naringin content in local citrus fruits. Food Chem 1990;37:113-21. Di Majo D, Giammanco M, La Guardia M, Tripoli E, Giammanco S, Finotti E. flavanones in citrus fruit: Structure – Antioxidant activity relationships. Food Res Int 2005;38:1161-6. So FV, Guthrie N, Chambers AF, Carroll KK. Inhibition of proliferation of estrogen receptor-positive MCF-7 human breast cancer cells by flavonoids in the presence and absence of excess estrogen. Cancer Lett 1997;112:127-33. Lee CH, Jeong TS, Choi YK, Hyun BH, Oh GT, Kim EH, et al. Anti-atherogenic effect of citrus flavonoids, naringin and naringenin, associated with hepatic ACAT and aortic VCAM-1 and MCP-1 in high cholesterol-fed rabbits. Biochem Biophys Res Commun 2001;284:681-8. Lee MH, Yoon S, Moon JO. The flavonoid naringenin inhibits dimethylnitrosamine-induced liver damage in rats. Biol Pharm Bull 2004;27:72-6. Badary OA, Abdel-Maksoud S, Ahmed WA, Owieda GH. 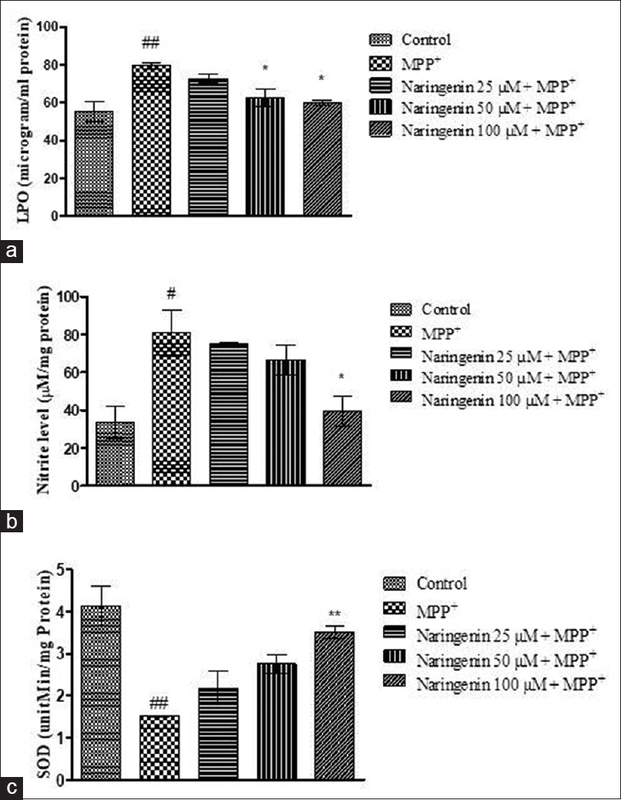 Naringenin attenuates cisplatin nephrotoxicity in rats. Life Sci 2005;76:2125-35. Tarozzi A, Morroni F, Hrelia S, Angeloni C, Marchesi A, Cantelli-Forti G, et al . Neuroprotective effects of anthocyanins and their in vivo metabolites in SH-SY5Y cells. Neurosci Lett 2007;424:36-40. Jin Q, Kang C, Soh Y, Sohn NW, Lee J, Cho YH, et al. Tetrandrine cytotoxicity and its dual effect on oxidative stress-induced apoptosis through modulating cellular redox states in neuro 2a mouse neuroblastoma cells. Life Sci 2002;71:2053-66. LeBel CP, Ali SF, McKee M, Bondy SC. Organometal-induced increases in oxygen reactive species: The potential of 2',7'-dichlorofluorescin diacetate as an index of neurotoxic damage. Toxicol Appl Pharmacol 1990;104:17-24. Kakkar P, Das B, Viswanathan PN. A modified spectrophotometric assay of superoxide dismutase. Indian J Biochem Biophys 1984;21:130-2. Moncada S, Palmer RM, Higgs EA. Nitric oxide: Physiology, pathophysiology, and pharmacology. Pharmacol Rev 1991;43:109-42. Bauché F, Stéphan JP, Touzalin AM, Jégou B. In vitro regulation of an inducible-type NO synthase in the rat seminiferous tubule cells. Biol Reprod 1998;58:431-8. Mizuno Y, Ohta S, Tanaka M, Takamiya S, Suzuki K, Sato T, et al . Deficiencies in complex I subunits of the respiratory chain in Parkinson's disease. Biochem Biophys Res Commun 1989;163:1450-5. Levy OA, Malagelada C, Greene LA. Cell death pathways in Parkinson's disease: Proximal triggers, distal effectors, and final steps. Apoptosis 2009;14:478-500. Lee DH, Kim CS, Lee YJ. Astaxanthin protects against MPTP/MPP*-induced mitochondrial dysfunction and ROS production in vivo and in vitro. Food Chem Toxicol 2011;49:271-80. Wang Q, Liu Y, Zhou J. Neuroinflammation in Parkinson's disease and its potential as therapeutic target. Transl Neurodegener 2015;4:19. Sachdeva AK, Chopra K. Naringin mitigate okadaic acid-induced cognitive impairment in an experimental paradigm of Alzheimer's disease. J Funct Foods 2015;19:110-25. Vila M, Bové J, Dehay B, Rodríguez-Muela N, Boya P. Lysosomal membrane permeabilization in Parkinson disease. Autophagy 2011;7:98-100.